Piccotts End is a dot on the Chilterns landscape; somewhere you wouldn’t even pass through as the busy Leighton Buzzard road bypasses the village. Yet this tiny settlement has one of the most remarkable and historically important features, tucked away inside a Grade I Listed 15th century cottage at No.132 Piccotts End. Extremely rare and of national importance, these Pre-Reformation Catholic paintings, were hidden behind a sheet of course hand-woven linen until they were discovered by Arthur Lindley in 1953. Compared with many murals found mainly in local churches that were either damaged, destroyed or simply never completed, these rare, fine in situ examples, that briefly saw the light of candles for 50 years or so, before being covered up for over 500 years, are a sensation. I feel privileged to have seen them. 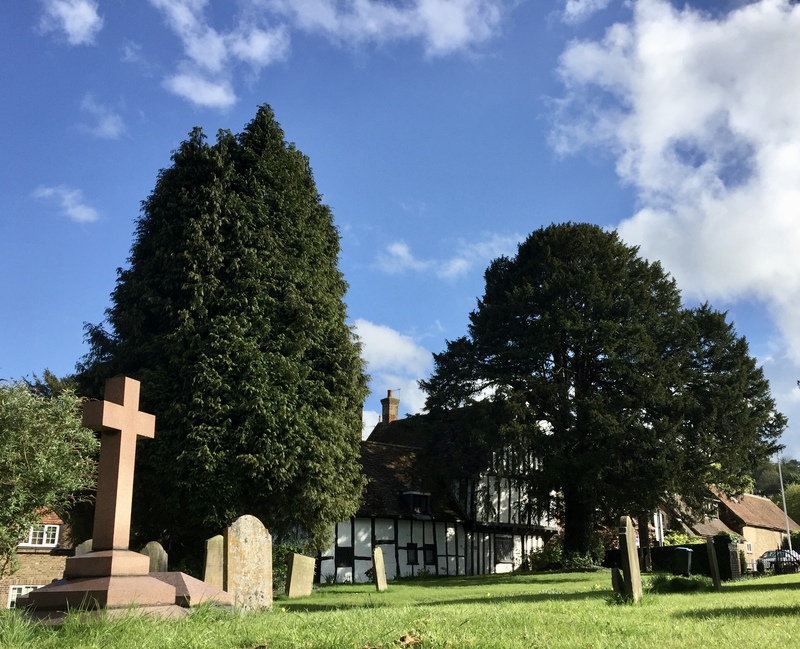 The co-owners of this remarkable building, Karen and Alison have moved heaven and earth to ensure these treasures have not been lost to property developers or simply careless conservation, they are custodians of medieval history in the Chilterns and they do so without funding nor support. Arthur Lindley’s son Alistair, picks up the story: “In 1924 my father bought these cottages and a nearby house and opened a petrol station to cater for the busy Hemel Hempstead and Leighton Buzzard traffic. He describes the buildings as ‘hovels’, this one inhabited for 78 years by a widow, whose husband had lived and died doing what he loved best; smoking in bed!” A lucky escape for the house you could say. Arthur Lindley invested in the serves of a lady referred to as “Olive the Scraper” who spent many many hours scraping off past layers and so helped uncover the entire panel. 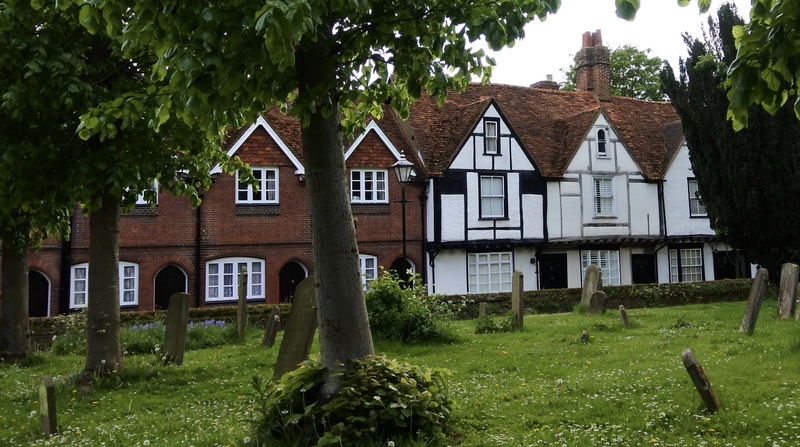 The cottages were built 600 years ago as a hospice for pilgrims on their way from the Abbey of St Albans to the monastery at Ashridge. The Abbey attracted pilgrims who visited the shrine of the first English martyr, and could have taken the 13-mile journey to the nearby Monastery of the Bonhommes at Ashridge. On the pilgrim trail to view a holy relic – a phial of the blood of Christ, Piccotts End being mid-way between the two, would have served well as place for the pilgrims to rest and take refreshment before continuing their journey through the forest to Ashridge. The murals are dated from between 1470 – 1500, and could only have been on display for around 50 years due to the Protestant Reformation in the 16th century, and is most likely the reason for the damage to the faces. The fact they survived this event, is in itself remarkable. One theory is that the faces were damaged on purpose to ‘buy some time’ before they were covered up. For good. That is what makes them so rare; up and down the country, parish churches, abbey’s, monasteries and cathedrals were destroyed, or returned to the Crown, stripped of their riches and relics as King Henry Vlll became Head of the Church. What is its meaning? To the modern eyes, it’s a jumble of symbolism and hard-to-detect imagery (including the All seeing Eye), that needs either many hours of looking at the paintings, or someone to show you the swallows (who were thought to spend the winter in holes in the ground), a dragon, a grinning cat, claw hammer, St Peter and the keys to heaven, even safety pins. I recognise those! All from a time when there was little literacy and religious symbols were a powerful influence in people’s lives. Part of the second floor was removed to show the entire mural as it was meant to be seen. The building had no natural light, so viewing the mural would have been difficult for the pilgrims, but perhaps they had a resident storyteller and interpreter who led them through the story of the heresy of the Cathars, who believed that if God was all good, why did he create and allow evil? Pope Innocent lll called a crusade against them which resulted in the slaughter of 30,000, indistinguishable between Catholics and Cathars. I felt this account to still be raw today, as Alistair asked if any Catholics were present before he shared this piece of information. By choosing to remain silent, I know even more will be shared, unpalatable as it might be. In 1825, Sir Astley Paston Cooper founded the first cottage hospital in the country on the site of these cottages at Piccotts End. This is only part of the Piccotts End story as there are strong local connections between St Margaret in the painting and the nearby Amaravati Buddhist Monastery at St Margarets, Great Gaddesden. This area once boasted a busy straw growing and weaving industry that linked these traditional farm house-crafts with the high streets of Luton, the mills at Tring and China. Now long gone, their traces are revealed in unusual ways; such as the providing unknowing protection for the mural at the time when the house had a second floor and where the floor boards didn’t quite meet the wall, where the bedding straw fell in between the two, provided protection for the painting. 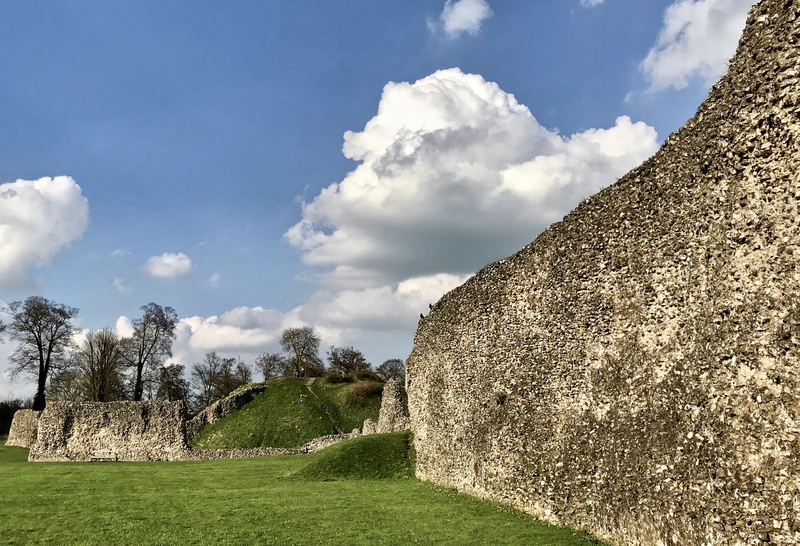 Abbey Walks is dedicated to mapping long distance footpaths that monks walked from abbey to abbey in the 12th to 14th centuries and they have some lovely local routes that link into long distance paths that could take the adventurous all the way to Rome! 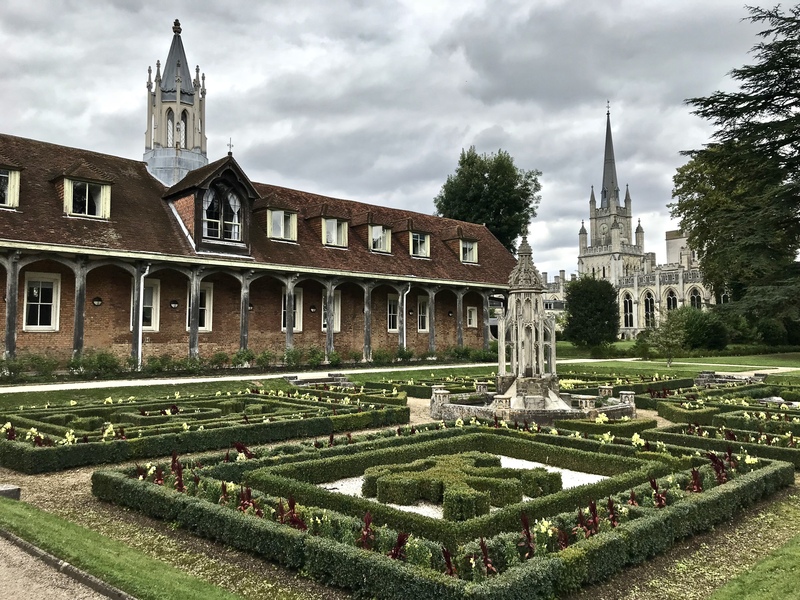 The monastery and monks are long gone, buildings destroyed, treasures looted and the monks banished during the 16th century Dissolution of Monasteries on the orders of King Henry Vlll, but holy relics were once a flourishing trade at Ashridge. Find out more about the naturally outstanding Chilterns.